With our extensive Winnipeg roofing experience, from century old homes to new developments, we know a lot about shingles and what’s best for your home. At Above All, we can install many different types of fibreglass laminate shingle products. The type of shingle that is best for your house will depend on your specific situation and preference. Most often we recommend CertainTeed, Owens Corning or IKO shingles but install most other manufacturers upon request. Durable, beautiful color-blended line of shingles. The widest array of colours to suit any trim, stucco or siding colour. It’s engineered to outperform ordinary roofing in every category, keeping you comfortable, your home protected, and your peace-of-mind intact for years to come with a transferable warranty that’s a leader in the industry. The Owens Corning TruDefinition Duration family of shingles offers a high-end, premium look which gives homeowners the aesthetics they desire at an attractive price. Featuring SureNail® Technology, an Algae Resistance Limited Warranty, enhanced wind warranty coverage of 130 MPH, and a Lifetime Limited Warranty (for as long as homeowner owns the home). TruDefinition Duration Shingles are available in popular colours with bold, lively contrast and complementary shadow lines for greater dimension. Cambridge combines beauty with contemporary strength. Manufactured in a larger size to offer more exposure and create a high definition ”shake” look for your roof, these popular shingles are versatile and easy to maintain and come in a variety of colors to suit any home. When your home is a showcase for luxury and comfort, IKO’s Royal Estate laminated shingles provide years of distinction and durability – at a value for you. 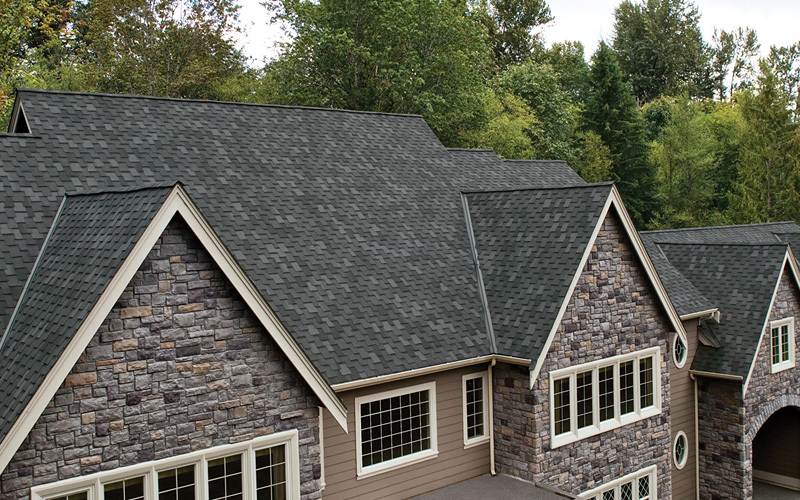 Each shingle boasts a range of subtle color variations that evoke the look of true slate. Contemporary materials and advanced technology make Royal Estate a lasting investment. Featuring algae-resistant granules, these shingles are easy to install and boast a Limited Lifetime warranty.